Fall is well underway here in Saskatoon. There’s a distinct chill in the air warning of the fast approach of winter, but for now the city has been splashed with vibrant yellows, oranges and reds. 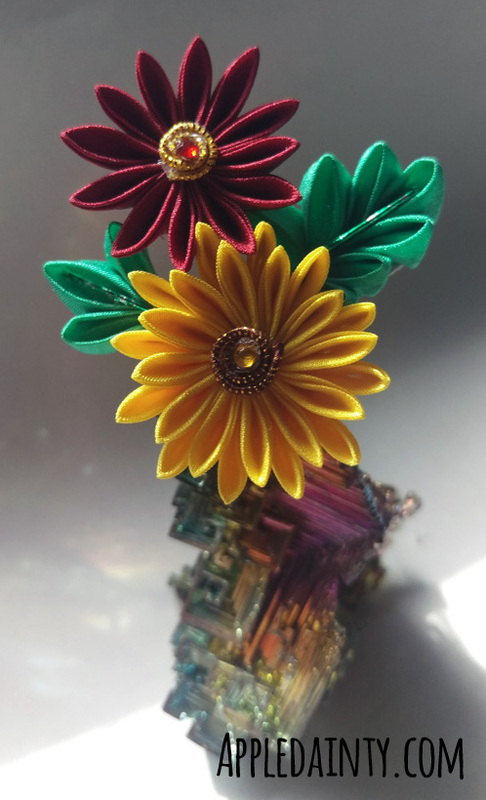 With all these fall colors about, I feel now would be a good time to blog about chrysanthemum kanzashi pieces and maybe chat a little about convention season – which for me is fall! 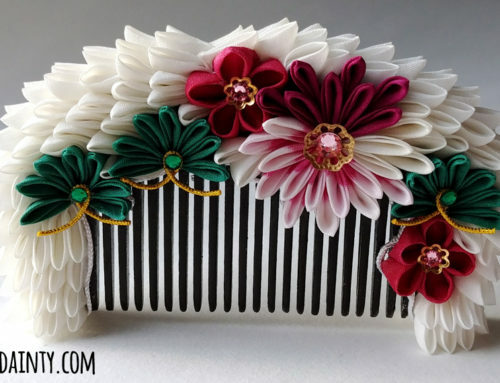 Chrysanthemums, or kiku, have been a popular theme for kanzashi. 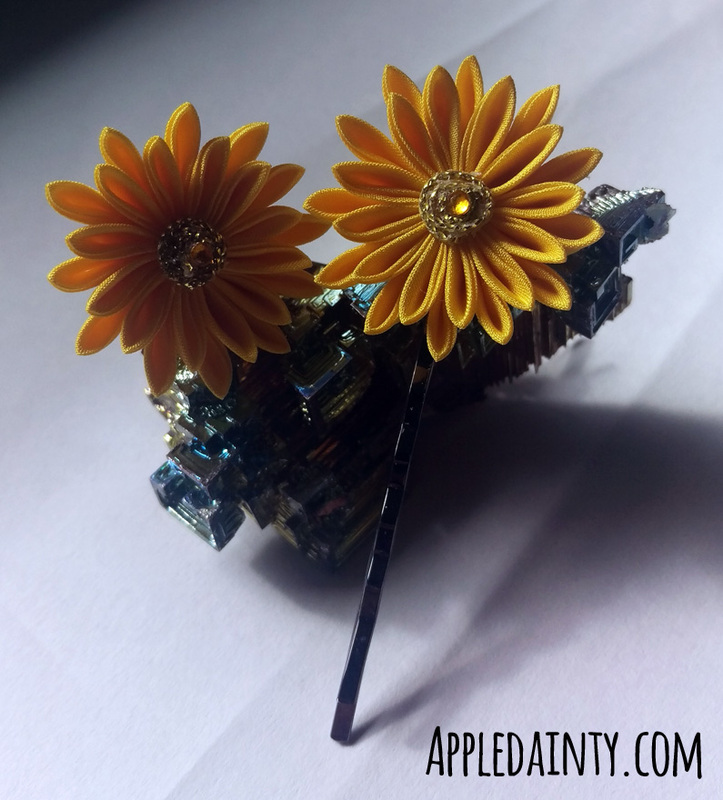 I’ve seen them most often in bright yellow or white, although they do come in other colors as well – my favorite being delicate silver wirework spider chrysanthemums. 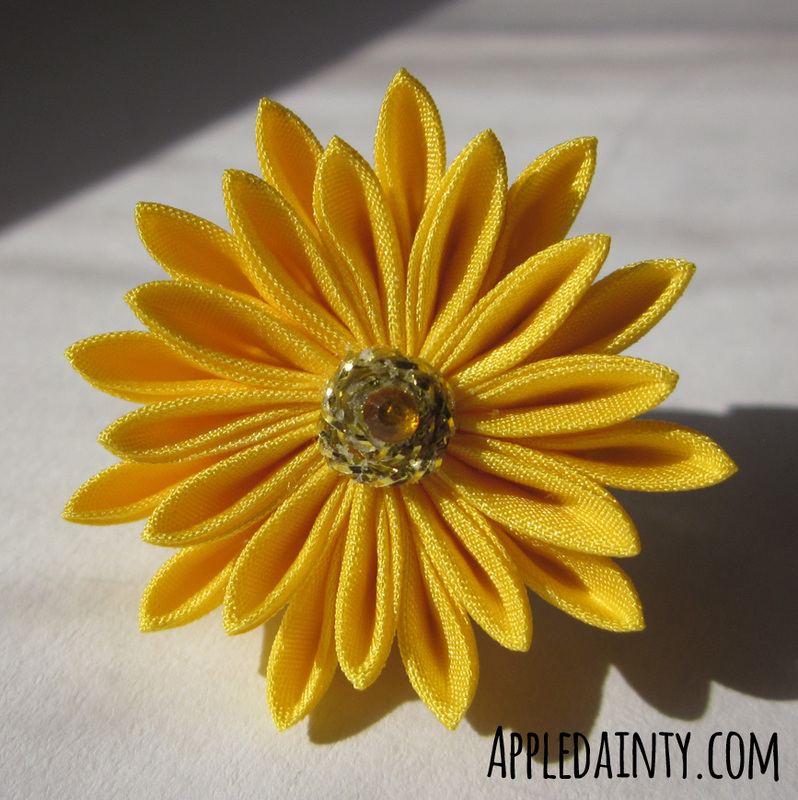 When I started brainstorming ideas for October kanzashi, it wasn’t hard to land on warm yellow-orange chrysanthemums. I also dyed some red-orange and red-purple shades to complement my yellow-orange and continue the fall feeling. Now that SaskExpo is over and we’re back from our wonderful Hawaiian vacation, I’m getting ready for the Calgary Expo Holiday Market in November. I’ve been spending my evenings and weekends dyeing new colors, crafting new kanzashi and refining my plans. In a lot of ways SaskExpo was an experiment. I came in with a lot of assumptions about what would be popular and what would or would’t work, and some new things that I was completely unsure of but wanted to test out. A lot of my assumptions were correct, but some were not. For example, plum blossoms were really popular. I sold out of almost all my plum blossom pieces. I thought for sure cherry blossoms would be number one! 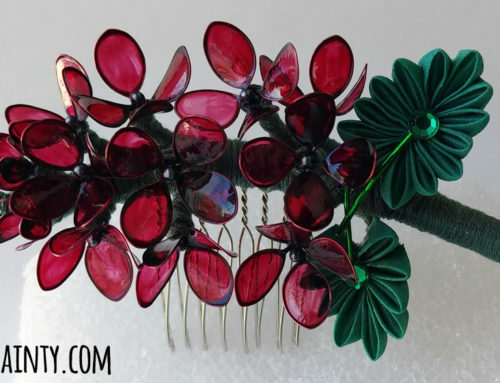 After getting a feel for what was/was not working, I decided that for the upcoming Calgary Expo Holiday Market I would concentrate on hairpins and lapel pins. I might bring a few holiday themed items with me, as it is a Holiday Market, but there is a balance between productivity and stress and I don’t want to push. Having a few new/experimental items to test is good, but I would rather spend my limited crafting time making things that I know will sell well than push too hard to make a bunch of extras that flop. It seems that artists often push themselves to meet grueling deadlines, ignoring pain or discomfort. There is always an element of stress involved with creating and selling art, but my first priority is my health and happiness and that of my family. No one likes dealing with a hangry, stressed out artist any more than we like being hangry and stressed! There is also the issue of space; more products mean larger displays and more difficult set ups. Artist’s Alleys have changed a lot since I first started; so many people bring huge displays with racks and shelves in order to maximize space. Call me old and curmudgeonly, but I hate the giant displays. I follow a simplified approach; my goal is to be able to transport, set up, and take down by myself. I am a bit short, so my husband usually sets up my vertical banner, but I could probably do that if I really tried. I use vintage looking suitcases (one medium roller, one small hand carry) to transport my goods and also use them as part of my table display. I learned a lot from SaskExpo about what I do and do not need, so I’m hoping I can pare down my packing list and have an even smoother set up in Calgary. My preparation for Calgary is going really well so far (knock on wood!). It would have been nice to sell out at SaskExpo, but it’s truly a relief not having to restock from scratch. I’ve been crossing a few things off my to-do list each day and with any luck I’ll be ready for Calgary early and have time to splurge on experimental pieces. I’ve also made time to work on gifts for friends and family. Christmas always creeps up faster than I expect it to. Every year I tell myself ‘This year I’m going to get ahead of the game!’ and end up scrambling to finish things anyway. This year I’ve got a nine tailed fox and kit sculpture I want to see done, Christmas ornaments, and a few other surprises. Speaking of surprises, I did finish a few before leaving for Hawaii. 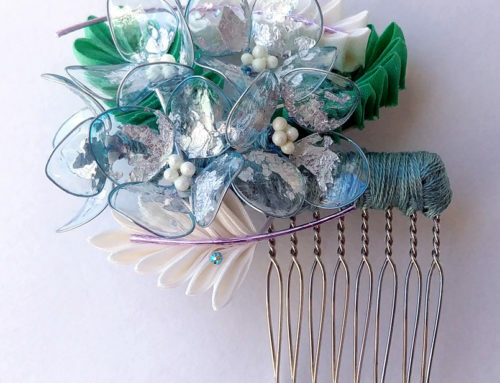 Unfortunately I didn’t get any snaps of the kanzashi hairpins and clips I made for my not-so-little cousins in Hawaii. I was up late trying to finish them the night before we left. But, I did get a couple of this pin for my friend Caitlin. 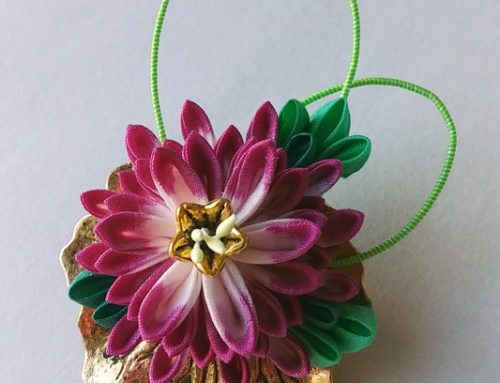 She’s getting married this year and I made her a medium pin featuring a red-purple chrysanthemum, plum blossom, and maple leaf. Anyhoo, that’s all I’ve got for this week. If you’re in the Calgary area, I hope you come out to see me and all the other wonderful artists and craftspeople at Calgary Expo Holiday Market. 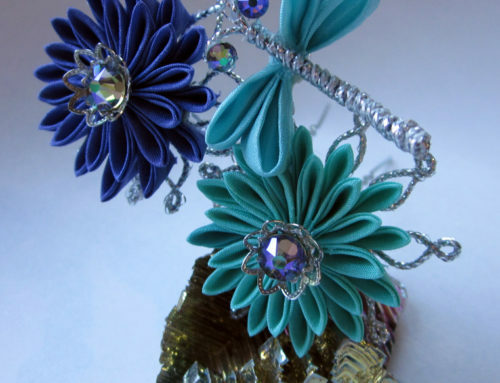 I’ll be at booth #913 with my fabulous floral wares. And as always I hope you check back here next week for more art, crafts, or cookery!